Staff photo by C.B. 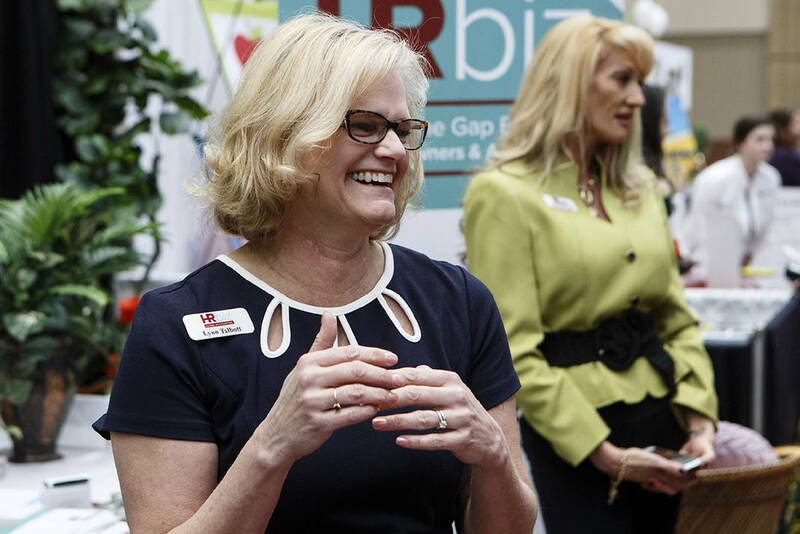 Schmelter / HR Business Solutions owner Lynn Talbott laughs while chatting during the Chattanooga Area Chamber's 2019 Expo Chattanooga at the Chattanooga Convention Center on Wednesday, March 20, 2019 in Chattanooga, Tenn. HR Business Solutions won the Chattanooga Area Chamber of Commerce Small Business Award for the 1-20 employees category. This story was updated Wednesday, March 20, 2019, at 8:29 p.m. with more information. Women were the biggest winners at the Chattanooga Area Chamber of Commerce Small Business Awards on Wednesday as three out of the four businesses and organizations honored were female-led or owned. The 2019 winners announced at the annual luncheon and business expo were HR Business Solutions in the 1-20 employees category, Office Furniture Warehouse with 21-50 employees, Hutton in the 51-300 employees category and Signal Centers won out among the nonprofits recognized. HR Business Solutions, Hutton and Signal Centers are all owned or led by women. Karen Hutton, president and CEO of Hutton, thanked all the small business owners in the room, stating the city of Chattanooga wouldn't be what it is today without them. "We all know how hard it is to run a business day in and day out with the trials and tribulations," Hutton said. "We know it's very difficult but to stand up and see all the women here today is remarkable ... I just want to thank the women for standing up and fighting through the barriers." Finalists included Blades Creative, Shah Trucking, The Bitter Alibi, Dwell Hotel, Metal Working Solutions, Trident Transport, Chattanooga Area Food Bank and Creative Discovery Museum. Award finalists and recipients are selected by an independent volunteer committee of local business leaders convened by the chamber. Chamber statistics show that 93 percent of Hamilton County businesses have less than 50 employees and 44 percent employ just one to four people. At Hutton, there are 85 employees. Started in 1998, the real estate, development and construction company focuses heavily on acquiring, managing and construction of single- tenant, multi-tenant and shopping center retail properties across the country. Hutton said, after the awards, that the company is diversifying and expanding into the self-storage space, as well. In the past 20 years, Hutton has completed nearly 1,100 projects comprising more than 10 million square feet for more than 100 retailers. In just the last five years, Hutton has more than doubled its number of employees. HR Business Solutions was started by Lynn Talbott in 2012 who is also a graduate of the INCubator at the Hamilton County Business Development Center. HR Biz uses QuickBooks and has helped over 100 Chattanooga-area startups with their financial records and bookkeeping, according to its website. "The Chamber makes being an entrepreneur in this city easy, and together I hope we can continue to help small businesses grow in Chattanooga," Talbott said after accepting the award. John Jerman is the president and founder of Office Furniture Warehouse in 2008 and the only male winner of the day. Office Furniture Warehouse is a new and used office furniture dealer, office mover and furniture services provider based in the Boyce Station neighborhood. Jerman said his company also started out in the Chamber's INCubator. Jerman was accompanied by his wife on stage Wednesday. "We couldn't get here without a lot of people, especially my wife who is my best friend and partner," he said. "I wouldn't be here without her. Every man who is successful can acknowledge there is a great woman behind him. I have a great one." Signal Centers provides early childhood education and services for adults and children with disabilities. Signal Centers is one of only five centers in the state of Tennessee to offer support with assistive technology and devices. In 2018, the nonprofit served 711 assistive- technology clients last year, 202 children in home programs, 172 children in their early learning center, 40 clients completed employment programs and 27 clients who previously earned jobs hit their one-year mark. CEO Donna McConnico described nonprofits in Chattanooga as efficient, innovative and collaborative. "We share resources and ideas every day and in a time where division and dissension seems inevitable, people from every persuasion come together in our city to work together to make a difference for our citizens," McConnico said. "We believe in Chattanooga that together we can do better."